It’s not often that I add a new artist to my list of favourites – especially a watercolour artist. But on seeing the work of Chinese artist Liu Yi a few years ago, I felt he had to be included somewhere near the top of that list. His paintings display an exceptional control of the watercolour medium without sacrificing any of its freshness and spontaneity. Liu Yi was born in Shanghai in 1958. I first came across his watercolour paintings in an article entitled ‘Destiny With Water’ in International Artist magazine (Issue 50, Aug-Sep 2006). The text of that article, in which he describes his watercolour technique, is available on this site. 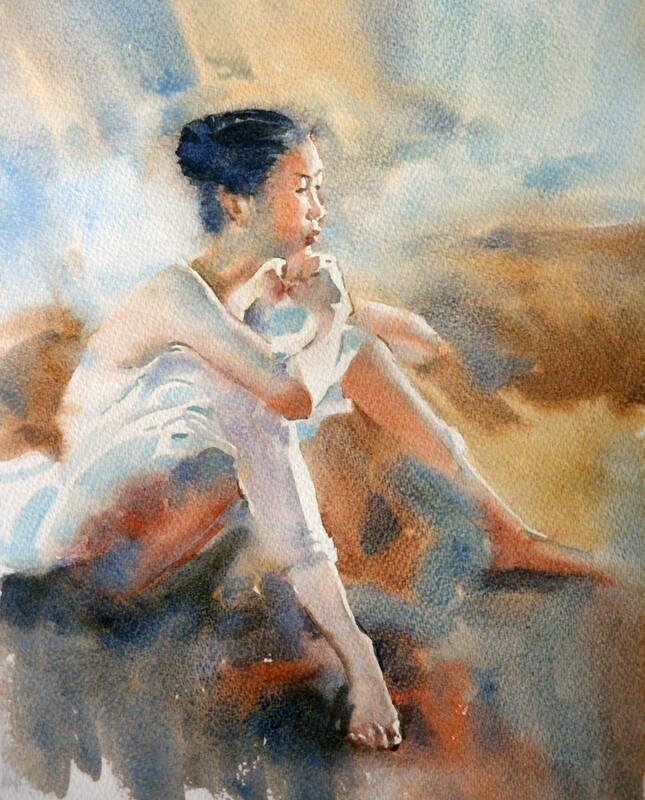 The paintings, a series of watercolours of ballerinas, can be seen on Liu Yi’s own website. The fascinating thing about Liu Yi’s watercolours is that, despite clearly working with a very wet technique, he manages to achieve superb control of his subject matter: the figures are beautifully drawn and painted, the material of the dresses and shoes depicted cleverly and convincingly while fully exploiting the inherent qualities of the medium. I decided to have a go at copying one of his ballerinas, following as closely as possible his working method. wash out overworked areas and soften edges. The website which includes Liu Yi’s interview also tells us that the watercolour papers that he uses are Saunders (presumably Waterford), Canson and Bockingford. All English, surprisingly. I mentioned earlier that there is some vagueness in his description: I’ve assumed that up to Step 6 the paper was wet while Steps 7 and 8 were done on dry paper. Also, it’s not clear precisely where the boundary lies between what he calls the ‘basic shapes and forms of the ballerinas’ and the detail. Nevertheless, apart from adding masking fluid to the highlight areas at the drawing stage, I pretty much followed Liu Yi’s method. How did it turn out? This is the result. I haven’t made a rigorous attempt at matching Liu Yi’s colour – working wet-in-wet makes it very difficult anyway. My focus was on getting the drawing and painting of the figure and costume as close to the original as I could. As an exercise in control of the medium, it was reasonably successful. However, even though the paper was soaked in a tub of water for 15 minutes before starting to paint on it, I found that it was impossible to avoid having to re-wet it more than once to complete the preliminary background and figure washes. This, of course, is probably because Liu Yi works more quickly than I do (this painting took around an hour-and-a-half to complete). The paper I used was either Bockingford or Saunders Waterford and re-wetting didn’t affect the earlier washes. As a lesson in painting the figure, this is a challenging exercise. I took care with the drawing, getting it as accurate as possible so that I could be sure that any deficiencies in the finished work would be down to the painting alone. The flesh colours that Liu Yi uses are both varied and subtle. He models parts of the face and limbs using changes in colour temperature as much as tonal variation. I found it best to apply each flesh colour to a previously wetted area and allow it to dry; then wet the area again before applying the next colour. This gave more control and transparency than trying to apply the colours wet-in-wet and allowing them to blend on the paper. The masking fluid played an important part in preserving the anatomical integrity of the figure and was removed only at the very end. Masking fluid also contributes greatly to the wonderful variety of edge treatment that he achieves. Working wet-in-wet is difficult because it’s very easy to misjudge the required strength of a wash or stroke with the result that it looks too light once it has dried. One way to compensate for this is to use pan watercolour rather than tubes. With pans, there’s a natural tendency to work a little drier and to pick up more colour which is better when working wet-in-wet. Simply looking at the paintings of Liu Yi cannot convey the delicacy of his handling of watercolour or his amazing control: only by attempting to copy an example of his work will you begin to appreciate his virtuosity and the possibilities of the watercolour medium. Hi your paintig is same dream .how you do those ballerin same silk material ?thanks alot . Perhaps you want to know that Liu Yi made a movie with our production this year. We would appreciate very much that might add a link to the movie. Congratulations on your website. We really like. I too tried to figure out the exact technique. Earlier I thought he work on some ricepaper or other sheet probably made in china. later I realized Perhaps it’s the experience and practice which gives him more freedom☺. David you really came very close. My style is totally different. I am still working hard to figure it out in totality. Keep us all updated new development.